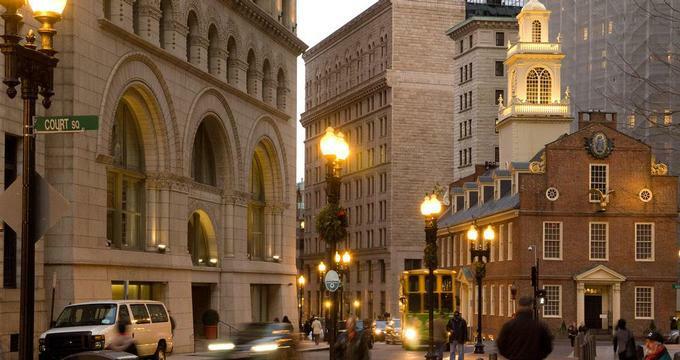 Boston is a beautiful city to visit, offering a choice of amazing hotels, great restaurants and many things to do. From romantic walks in the park to some of the finest museums in the country, the city will tempt you to return time after time. Visitors love Boston in the spring and fall because of the beautiful displays of color in Boston Common, the oldest city park in the United States. When planning your sightseeing and activities, remember to leave some time for pampering at a day spa. All of the hotels that made our list are known for their attentive service and unique amenities which will make your romantic trip fun and memorable. Top things to do in Boston for couples who love art: the Museum of Fine Arts and the Isabella Stewart Gardner Museum. Nine Zero Hotel is a boutique hotel with luxury guest rooms and suites. It is located in Tremont Street, in mid-town Boston near the financial and the theater districts, one block from the historic Boston Common. There are 190 guest rooms and suites featuring sleek decor, custom beds and attentive service. Amenities include free WiFi, complimentary morning coffee in the lobby, and access to travel essentials through the "Forgot It? We've Got It!" service in case you forget to pack something. Ask for one of the "Spectacular" rooms located on the top three floors of the hotel with floor-to-ceiling windows and scenic views of downtown. The daily Hosted Wine Hour is a great way to sample new wine and meet other guests. In the evening, have a romantic dinner at Highball Lounge while you listen to music. Room rates start at $199 per night (866-646-3937). Top Boston tourist attractions for history buffs: Boston Tea Party Ships & Museum, Boston's Freedom Trail and USS Constitution Museum. Fifteen Beacon Hotel is an elegant hotel in with 63 stylish guest rooms. If you want to stay at a place that feels more like a private residence than a hotel, check into this stylish property with only seven guest rooms per floor. Guest accommodations are furnished with a blend of modern and antique furniture, and a color scheme of taupe, cream and espresso. There is a gas fireplace in every room, cashmere throws, 42-inch tvs and luxurious bathrooms. If you are planning a romantic trip, ask for one of the rooms with a four poster and canopy bed. The hotel offers several specialty suites. Try the spectacular two-bedroom Gilbert Stuart Suite which measures 1,370 square feet in size and has not one but two sitting areas, a parlor with a boardroom table and three full bathrooms. The suite overlooks the historic Beacon Street. The hotel is situated in a renovated 1900s building in the prestigious Beacon Hill neighborhood where you will find quaint sidewalks and stylish boutique shops. You will be close to Boston Common and Public Garden. Guests receive courtesy in-town Lexus service. The eco-friendly hotel has a green policy which includes energy conservation, recycling and green cleaning products. Have dinner at Mooo restaurant, a culinary twist on the traditional steakhouse. The Wine Cellar is a private dining room which can accommodate up to 75 for a private party or a business dinner. The cellar features a collection of fine and rare wines. Rooms start at $395 per night (617-670-1500). 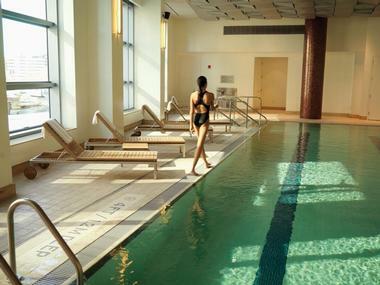 InterContinental Boston is a spa getaway with contemporary guest rooms and an indoor pool. 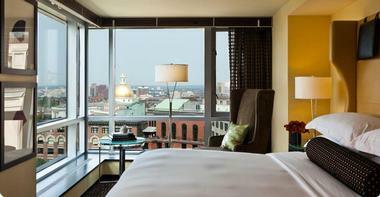 The hotel spa and health club measures 6,600 square feet in size and overlooks the Rose Kennedy Greenway. 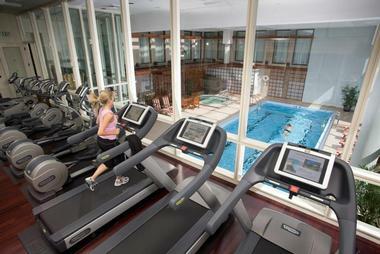 The spa features a Fitness Club, a heated lap pool, steam rooms, and six spa treatment rooms. Choose from an array of massages, mud treatments or stimulating facials. There are 424 contemporary guestrooms and suites with Waterfront and downtown skyline views. Amenities include original artwork, rich furnishings, four-fixture bathrooms with separate soaking tubs and plush bathrobes. 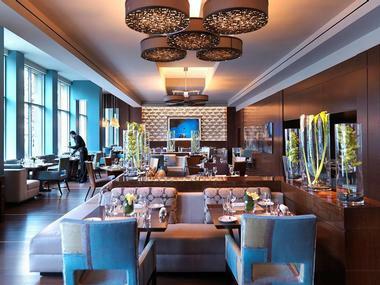 Club InterContinental, located on the 12th floor, offers its guests an additional layer of personalized service and amenities, such as complimentary breakfast, tea, coffee and soft drinks. Room rates start at $489 per night (617-747-1000). Read more: Best Time to Visit Boston, Massachusetts & Other Travel Tips. Mandarin Oriental, Boston has plenty to offer to couples: stylish guest rooms, convenient location on Boylston Street and a beautiful state-of-the-art day spa. Located on the 4th floor of the hotel, the 16,000-square-foot spa promotes balance and tranquility though a holistic approach. The spa has beautiful relaxation areas, a meditative space, and extensive heat and water experiences. Try one of the signature therapies, or choose from a menu of classical treatments, such as massages, facials and body wraps. The hotel offers a selection of luxury suites with scenic city views. The Premier Suite overlooks Back Bay's lively Boylston Street and is decorated in traditional New England style. Located on the fifth through eighth floors, the Premier Suites offer large bay windows and elegant marble bathrooms. Suite guests receive complimentary house car service within the city. Rooms start from $495 per night. The Langham Hotel, located in downtown Boston, overlooks the Norman B. Leventhal Park. The Renaissance-Revival granite and limestone building was constructed in 1922 and used to house Boston's Federal Reserve Bank. There are 326 rooms and suites decorated in French contemporary style. About a third of the hotel's rooms have sloped glass windows. The suites are named after French Burgundy wines. Loft suites, located on the hotel's second floor, feature a living room, a sleeping loft, and bathrooms on both levels. Guests enjoy an indoor health club with a swimming pool, 24-hour room service, high-speed Internet access, valet parking and 24-hour concierge service. 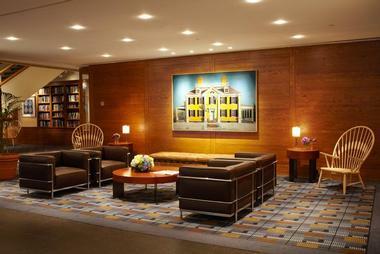 For business travelers, there is a full-service Business Center and nine meeting rooms. There are two restaurants and one of Boston's most famous piano bars. The Julien Bar is decorated with carved doorways, gilded ceilings and two N.C. Wyeth murals depicting Abraham Lincoln and George Washington. Julien, the hotel's AAA Four-Diamond award dining room, features vaulted gold leaf ceilings, wingback chairs and five beautiful chandeliers. The restaurant serves contemporary French cuisine. Cafe Fleuri is a brasserie-style restaurant with garden ambiance and an atrium ceiling. On Saturday afternoons from September to May, try the restaurant's incredible Chocolate Bar, an all-you-can-eat buffet of chocolate desserts such as cakes, brownies, pies and mousses. Room rates start at $270 per night (617-451-1900). For couples who prefer the feel of a cozy city inn, the Mary Prentiss offers couples a central location in Cambridge and a choice of accommodations. The deluxe garden patio rooms are especially romantic, featuring a fireplace and a two-person Jacuzzi, providing the perfect ambiance for relaxing after a day of sightseeing in Boston. Ask about the "Romance Package" which includes champagne, chocolate-covered strawberries and late checkout. Room at the Mary Prentiss Inn start at $229 per night (617-661-2929). Plan a romantic getaway to Boston and stay at The Fairmont Copley Plaza where you will be surrounded by opulence, gilded furnishings and a sense of tradition. Situated near Beacon Hill, Copley Place and Newbury Street shopping, this is one of the grand hotels which opened in 1912 and designed by Henry Janeway Hardenberghm. There are 386 individually decorated guest rooms, including 54 suites, with marble bathrooms. Choose from several dining options, including casual dining at the bistro-style cafe, the Oak Bar, and the Oak Room steakhouse. The Oak Bar serves raw oysters and other New England eats. The Oak Room is furnished with dark wood paneling, mirrored walls, and and twin Waterford crystal chandeliers. If you are planning a wedding or a special event, you'll be able to choose from several stylish options, including the Grand Ballroom, Oval Room and Copley's Grand Cafe. Across street is the Copley Place shopping mall featuring some of the leading brands, including Gucci, Louis Vuitton, Neiman Marcus, Tiffany & Co, and other stores. Rooms start from $219 USD per night (617-267-5300). Hotel Marlowe is a historic boutique getaway in Cambridge with modern interiors and central location near Harvard and MIT. Guests receive a complimentary daily evening wine reception and complimentary wireless internet access. There are 236 rooms and suites decorated with velvet fabrics, animal print carpeting and rich colors. Each room has a two-line phone with data port, flat-panel LCD and Etro bath amenities. Executive Suites and the Presidential Suites feature Fuji spa tubs. The property is pet friendly. Bambara serves American Brasserie cuisine with an emphasis on New England ingredients. The restaurant offers 24-hour room service. Room rates start at $139 (617-444-8637). 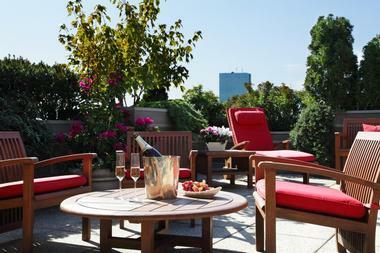 Enjoy scenic water views from the luxury Liberty Hotel located at the foot of Beacon Hill in Boston. Floor-to-ceiling windows make you feel like you are floating above the city and beautifully appointed rooms offer a warm sanctuary for a good night's rest. 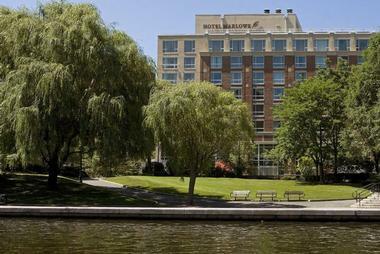 If you like to stay active when you travel, the hotel's proximity to the Charles River Esplanade is a great plus. You can go running, biking and even sailing and kayaking in the warmer season. Dining is a flavorful treat with a diverse menu that incorporates fresh local organic ingredients. 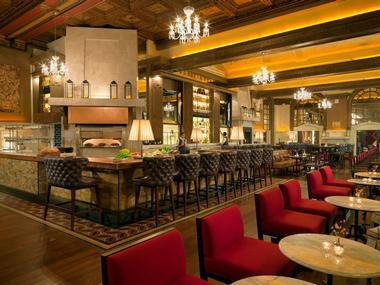 In the evening, invite friends for a drink at the stylish Liberty Bar or at the popular Alibi. Choose from 298 guest rooms and suites with plenty of light and great views of the water and the city skyline. Rates start at $299. 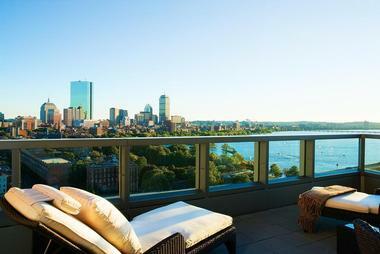 Look for seasonal specials, especially if you are planning a weekend getaway to Boston (617-224-4000). Stroll through the park to view more than 600 trees and seasonal floral displays, including stunning tulips in the spring. The Frog Pong lies at the heart of the 50-acre park and is a beautiful spot for a picnic in the summer. There is a carousel and a playground for kids, and ice skating in the winter. After exploring Boston Common, follow the Freedom Trail along a 2.5 mile look through downtown Boston and observe the historic sites along the way. The Museum of Fine Arts is one of the largest museums in the United States, containing over 400,000 works of art, including Egyptian artifacts, French impressionist paintings (including Degas, Monet, Van Gogh and Renoir), American art, Chinese paintings, and a beautiful Japanese garden. The museum offers seven permanent exhibits, including the Space Race, the Oval Office, First Lady Jacqueline Bouvier Kennedy exhibit and more. The New England Aquarium features a Giant Ocean Tank which simulates a Caribbean coral reef and houses sharks, eels, turtles, stingrays and other marine animals. Kids will love the penguin exhibit which houses several different species of penguins. In addition to the permanent exhibits, the aquarium also houses special exhibits, so be sure to check the schedule before you go. The Museum of Science features over 700 interactive exhibits, live presentations, shows at the Charles Hayden Planetarium, the Mugar Omni Theater and the IMAX. The museum also houses over 100 animals. The Energize exhibit lets you learn about renewable energies while the Theater of Electricityhouses the world's largest air-insulated Van de Graaff generator. Watch the famous Boston Symphony Orchestra play at the Symphony Hall, a U.S. National Historic Landmark and one of the top concert halls in the world.